ITEM: The above bears floating down the Thames are a rather splendid little art project designed to raise awareness for a new TV show. 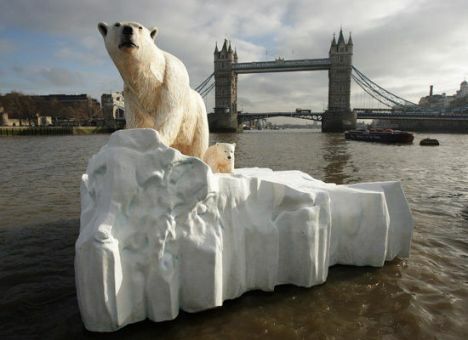 Sorry; they’re to raise awareness that the ice-caps are melting. But we already knew that, so it’s really just to pimp a TV show. It is marvellous, though. ITEM: Matt Damon is still whingeing on about how he doesn’t like James Bond. “They could never make a James Bond movie like any of the Bourne films, because Bond is an imperialist, misogynist sociopath who goes around bedding women and swilling martinis and killing people. He’s repulsive.” Given that James Bond thoroughly spanks Jason Bourne’s buttocks at the box office, I think he’s worried that people aren’t being properly repulsed. Touchy-feely Hollywood hippy. ITEM: Do homophobic IMDB users vote down gay films that raise their heads too high above the parapet? AwardsDaily seems to think so, pointing out that since Milk got its Oscar nomination for Best Picture it has racked up a surprising number of ‘1 out of 10′ votes. The same thing happened to Brokeback Mountain three years ago; more than 8% of Brokeback votes give it a ‘1′, forcing it out of the Top 250. Milk may go the same way - in the last week it fell 40 places at a time when most Best Picture nominees tend to see a bump. It’s notable that there aren’t any other gay movies in the Top 250 - unless you count Rope, The Wizard of Oz or Lord of the Rings - but honestly, there aren’t many gay movies that should be. Some people make good films and some people make gay films, but rarely does anyone manage to do both. Milk and Brokeback Mountain are two laudable exceptions to the rule. ITEM: Speaking of which, the Gay and Lesbian Alliance Against Defamation has announced its nominees for its annual Media Awards. As usual, there haven’t really enough positive gay representations in the media in the past year to make the list convincing. It’s not often you see the word ‘Torchwood’ appearing under the header ‘Outstanding Television Drama’. ITEM: Hooters, the world’s most famous breastaurant, faces fresh challenges in Texas from new rivals such as Twin Peaks and Bone Daddy’s. I don’t really care, I just like that someone has coined the word ‘breastaurant’. My question is, when are they going to create a man-candy version of Hooters? They can call it Peccadillo. I give that idea freely unto the world. ITEM: Your Wikipedia link for the day: exploding animals - where the categories ‘Animals’ and ‘Explosions’ meet.